So remember, when life seems a little tough, think of Aurora. She has lost two moms, watched her siblings die, recovered from severe illness, and yet she enjoys the small, sweet pleasures life has to offer - safety, food, warmth, and good friendships. Don't let Aurora's small stature fool you - her spirit is strong. She is one of 140 hens, roosters and chicks rescued from a hoarder. The story was featured on Animal Planet's Confessions: Animal Hoarding. Lost in the human-centered show were the chickens living in their own feces inside the home and not receiving proper care outside. When we saved her, Aurora exuded a "largeness", despite her small frame. Tiny and sick, it seemed unlikely she would survive. Having never received proper veterinary care, many of the chicks and adults were sick and some sadly died. At a young age, Aurora and her siblings were abandoned by their mom. Luckily, the other mother hens took on their care. Aurora seemed the last to get food and attention, though. She grew at a much slower rate than her brothers and sisters too. Everything seemed against her. Aurora eventually found solace with an older turkey hen named Margaret, nestling beneath her wings during the cold nights. As Aurora grew, we became more amazed at her dedication to simply living. Nothing deterred Aurora, not even pecks from bigger chickens or snubs at her valiant attempts at friendship. After Margaret came Bertha, a gentle hen with severe arthritis. Bertha mothered Aurora with kindness. Each night, Aurora snuggled close to Bertha, finding solace in the shared warmth. Bertha lived in pain, yet gave so much to keep Aurora content at night. Bertha finally succumbed to an unknown illness, dying on her own terms. Aurora, in her own way, mourns Bertha. Every evening, you will find Aurora on the same perch, in the same spot where she kept Bertha company. Even when the other chickens try to push her away, Aurora comes back. 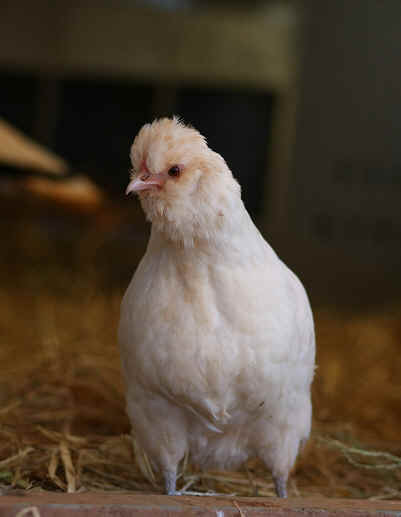 At the young age of seven months, Aurora has lost two moms and struggles to find her place in the chicken flock. Despite earlier travails, she shows an incredible desire to enjoy her time at the sanctuary. We are pleased to find Aurora accompanying her new friend, Lavender, a Rhode Island Red hen. Aurora finds Lavender interesting and copies everything she does, trying to get into Lavender's good graces.